Sometimes I just love being pregnant. Pregnancy gives you certain rights. Rights to nap in the middle of the day without being considered lazy. Rights to freak out without being dragged to the loony bin. Rights to cry JUST BECAUSE. And, most importantly, the right to eat. While I've actually been really good this time around, and am not sustaining on the menu of pizza, hamburgers and chocolate cake like I did last time around, you can still "demand" things and no one thinks the worst of you. Like In and Out burger at 2:00 pm. Or, the infamous Pinkberry at 8:30 PM with your 3 year old. Upon learning that there is a Pinkberry a mere 10 minutes from my parents house thrilled me to no end. See, I was going to drive all of us kicking and screaming to the furthest reaches of LA if that's what it took to get me my not-really-frozen-yogurt treat. 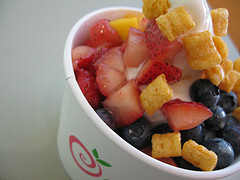 While it appears to be frozen yogurt.. no one really knows exactly what it is. All we know is that a) Its Korean b) its made from a powder c) it has 25 calories and 5 grams of sugar per ounce d) the lines are never less than 25 people deep to get one at any hour of the day. Insanity. Pure freaking insanity. For a sourish frozen treat topped with fruits and maybe chocolate chips. But can I tell you?? ITS DELICIOUS. It's a little more "sour" than a creamy fro-yo.. and Jason hit the nail on the head when he noticed the main difference is that the delightful fresh fruits (I had mango, strawberries and chocolate chips) are fresh, juicy and not hard and frozen like at most frozen yogurt places. But after sharing mine with me last night, Lucas flew into a massive energy episode, stayed up until after 10 PM, then woke up at 2AM and 5AM. Which leads us to ask... what the hell is really in that stuff?? ?